Place a few drops of food coloring in the can of Betty Crocker™ Rich & Creamy white frosting. Stir until you get a nice grass color. Scoop frosting into a disposable icing bag with a Wilton™ #233 grass/fur piping tip. Squeeze out the frosting onto the peanut butter cup so the frosting looks like grass. Place a chocolate football on top. You can unwrap the foil chocolate footballs and pipe on white laces with icing if you’d like. After the nachos and hot wings, these peanut butter cups are the perfect game day dessert. Let me tell you, football is on at our house 24/7. And with football comes FOOD. Serious food. And after all of the pizza, chips, dips, mini pigs in a blanket, nachos, chili and – well, you get my drift – is gobbled up, my guys want dessert. In the past I have labored over cookies cut out in football shapes and color-coordinated to whichever team we are rooting for. I’ve even made meticulously decorated cakes to resemble a football field. I found myself a little annoyed when my guys would devour these desserts in seconds when it took me so long to make them! That’s when I came up with these brilliant Game Day Peanut Butter Cups. They're so cute, and I’m all about cute food. My hubby, sons and all of their friends appreciate chocolate and peanut butter, so it’s a win/win! When these turf -topped peanut butter cups are mindlessly popped into the mouths of my guys screaming at the television, I don’t feel too badly because they are so easy to make! 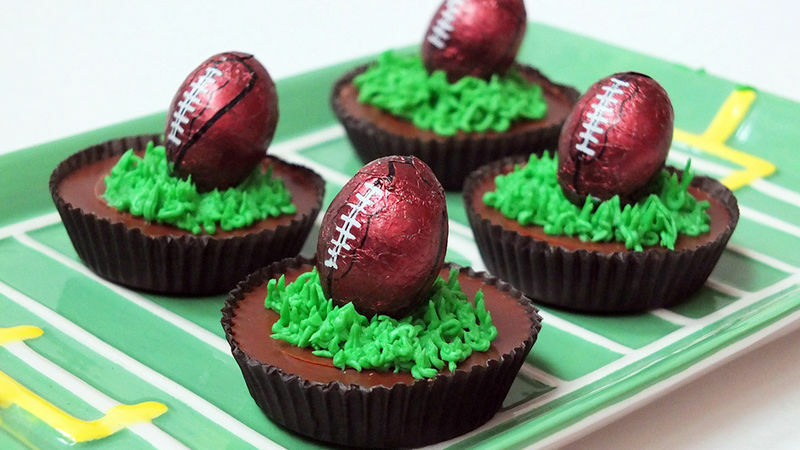 Start with some green frosting, chocolate footballs covered in foil wrappers and of course, peanut butter cups. Pipe some delicious turf using the green frosting and a grass-icing tip on top of the peanut butter cup. Now top it off with a chocolate football. Touchdown! Who says football can’t be cute? Sweet victory!